It feels a little strange to be writing about our winter adventures while the sun is shining over Vancouver and temperatures hit 22 degrees Celsius this afternoon (that’s 72 degrees for our friends to the south). It’s only been a few weeks since our trip to Sun Peaks, but we did visit late in the season and summer has decided to arrive early here in the beautiful Pacific Northwest. No complaints over here! Today, we’d like to share our experience dog sledding with Mountain Man Adventures. We went dog sledding last year, when we visited the Canadian Rockies (more on that experience here), but this time our oldest boy, Braydon, came along for the ride. I suppose it’s worth mentioning that the mountain resort has shut down its winter activities and is now shifting its focus to summer adventures. So, if this post inspires you to visit British Columbia and try dog sledding, you’ll just have to wait until the next winter season begins! Braydon loves dogs. His favorite stuffie is a blue and white puppy, aptly named “Puppy”, and this stuffed animal goes every where he goes. I mean EVERY where. Over the past few months, on numerous occasions, Braydon has said, “I really wish I had a real dog”. He’s not getting one. No way, no chance. Our lifestyle is not ideal for puppy ownership and we’ve got enough on our plate as is, but it’s nice to see that he has a soft spot for animals. When the good people at Sun Peaks Resort asked if we’d be interested in going on a dog sledding tour I jumped at the opportunity, knowing that Braydon would love it. It would be a perfect mommy-and-son winter adventure. The kennels and trails are located just outside the alpine village. We made our way to the Sundance Daycare Centre and jumped on a short shuttle that transported us to the facility. The shuttle bus was greeted by Campbell and two energetic Alaskan Husky puppies who were waiting eagerly for our arrival. Braydon immediately wanted to play with the dogs. Campbell introduced us to the team that would be pulling our sled that afternoon. They jumped and barked with excitement. You can tell they love running through the forest. Braydon and I were paired with Campbell. There were 3 groups that afternoon. Each dog sled carries two passengers. Braydon was thrilled to have the opportunity to pet each dog and say hello before we snuggled in the sled. The name of the dogs pulling our sled that afternoon was Pilsner, Sparkey, Turtles, Burton, Oakley, Porter and Dusty. A few of the dogs were quite affectionate and they smiled as we rubbed and patted their heads. It’s common practice for Mountain Man Dog Sledding Adventures to ask that all guests greet their dogs first, and make sure they give them attention. Campbell explained that they want their dogs to be well socialized. It’s evident that the owners love their dogs and that they’re treated well. It snowed a lot that day, which made for perfect conditions. Fortunately, we were prepared for the conditions and had our Columbia snowboarding gear with us, including googles. Weather and temperatures in the mountains can change quickly, so it’s always wise to prepare for all weather conditions. We climbed into the sled with Campbell’s assistance and got quite cozy. We were bundled together with Braydon sitting between my legs. He curled up and got comfy. He was so comfortable, in fact, that I thought he was going to fall asleep (he learned to ski earlier that day, so he was getting tired). Once we were snug in the sled, Campbell began to attach the dogs to the ropes. He explained that each dog’s position plays a different role and, in most cases, the dog don’t switch positions. For example, the lead dogs will always stay as lead dogs. The dogs jumped and barked with anticipation. They knew it was almost time to go. Campbell released the break and within seconds we were off! Click on the short video above to see the trail. If you’re having trouble viewing the video you can watch it on YouTube here. The dog sledding took about 45 minutes. The tour we did is called Bark at the Moon. The best part about this tour is that it runs mostly through the thick forest, which creates a fun atmosphere. The dogs knew the narrow route very well but Campbell still warned us when a sharp turn was coming up, just in case. It’s amazing how fast the team of Alaskan Huskies can run. They aren’t very big dogs but they get that sled moving pretty fast. Campbell told us that they need to eat 6,000 calories per day to maintain the energy needed to pull the sleds. These working dogs don’t run every day during the winter months. They do get days off. The tour went by quickly. Before we knew it we were back at the kennels. To my surprise, Braydon did not fall asleep. He sat quietly and watched the trees pass by as we glided through the snow covered forest. After the sledding we had the opportunity to feed the dogs a treat. Braydon loved this part of the experience. He would throw a piece of meat up in the air and the dogs would leap to catch it with their teeth. We gave the dogs a big rub on the head and thanked them for the tour. They snuggled and licked our hands as we said good bye. 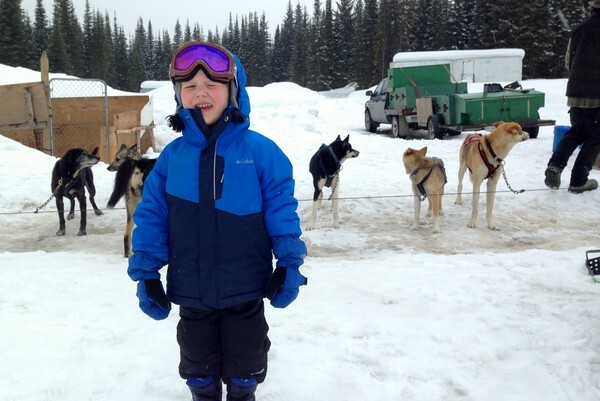 Overall, our experience dog sledding at Sun Peaks with Mountain Man Adventures was great. The tour was just the right amount of time and it’s clear that the staff treat the dogs with lots of love and care. 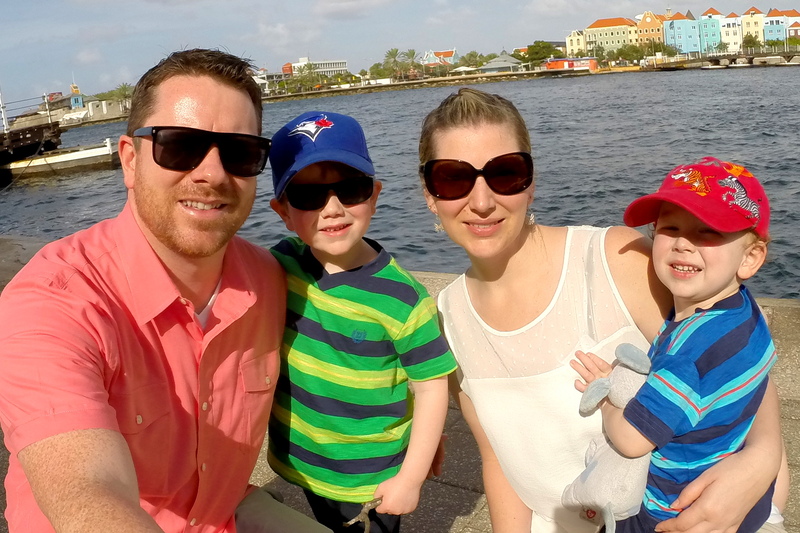 I’m so glad that Braydon and I were able to have this special mommy-and-son adventure together. It was the perfect way to spend the afternoon in the mountains. Price is $150/sled based on 2 adults up to 350 lbs combined OR $125 for a single passenger. Tipping is appreciated. You can drive to the trail or catch a short shuttle that picks up passengers in front of the Sundance Daycare Centre. We stayed at the iconic Coast Sundance Lodge. It’s perfectly located within steps of the two main chair lifts and offers the best ski-in/ski-out experience at Sun Peaks Resort. Bring goggles, gloves and ski gear. Weather in the mountains is unpredictable. This looks like quite an experience. I never thought I’d be interested in doing this until I read your post. BTW, it looks like you had a lot of fun. This is included on my bucket list.. yeah, I haven’t tried it yet. 🙁 I love the photo where one of the dogs was turned upside down. So cute!